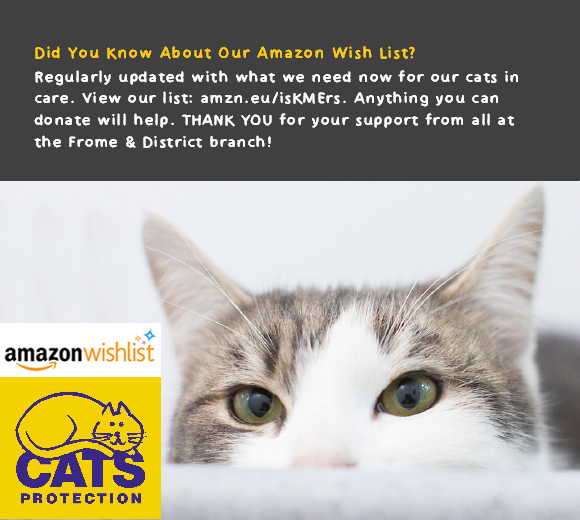 We have set up an Amazon wish list for the Frome and District branch of Cats Protection. Our branch is run by a group of dedicated volunteers and we rely solely on the generosity of our supporters and donations from the public. Anything you can donate to us, however small, is greatly appreciated. We are always in need of items for the cats but we also need tombola prizes and cat-themed gifts to sell at our events. ALL donations go a long way towards helping the cats and kittens in our care while they are waiting for their furrever homes. There are items to suit all budgets so anything you are able to supply us with, we would be extremely grateful for. THANK YOU for taking the time to look at our list! Browse and buy from our Amazon wish list.